The Cathedral celebrated the day of its patron, Saint Sergius of Radonezh, on October 7-8, 2009. Bishop Peter of Cleveland officiated at the Divine services. 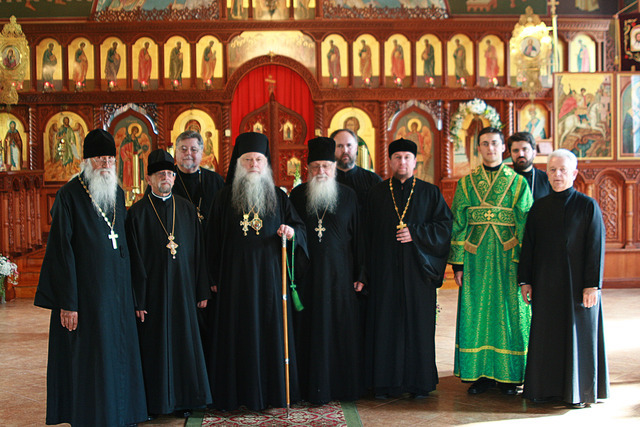 Joining His Grace was the Dean of the Cathedral, Priest Ilia Marzev, as well as the Cathedral clergy: Archpriest Peter Burlakov, Archpriest Peter Selenoi, and Deacon Nikolai Pravitsky. Several local clergymen also participated in the festive services: Archpriest Roman Starr, Archpriest Basil Stoyko, and Priest Victor Trotskyy. During the reading of the hours, Reader Andrew Rodzianko was ordained to the rank of Subdeacon. The Divine Liturgy was followed with a Cross procession around the cathedral. At the conclusion of the services, Bishop Peter presented a Thanksgiving Gramota (Proclaimation) to Daniel and Jane Gildenmeister for their labors in the founding and care of St. Tikhon Russian Orthodox Mission in Sandusky, OH.